As an expat you have no idea where to go when it comes to health care. You have no doctor, pharmacist or physical therapist. If you often have business trips, it's even worse! You only got a short amount of time to find out where they can give you the best and required service. Expat Medical Service is here to solve these kind of problems! Fysio2You is a physical therapy company that focuses on expats. We can treat people in any setting; at their home, office and hotel. You can decide when and where you would like the treatment. If you have any physical problem and/or you are in pain, you need a physical therapist who will come to your location, right away. Fysio2You will make it happen for you. Make an appointment and we come to you as soon as possible! Rehabilitation after traumatic and non-traumatic injuries. All kind of movement issues like neck, back, knee, ankle, elbow, wrist, hip etc. Ligament tears and bone fractures. Welcome to Amsterdam Central Pharmacy! 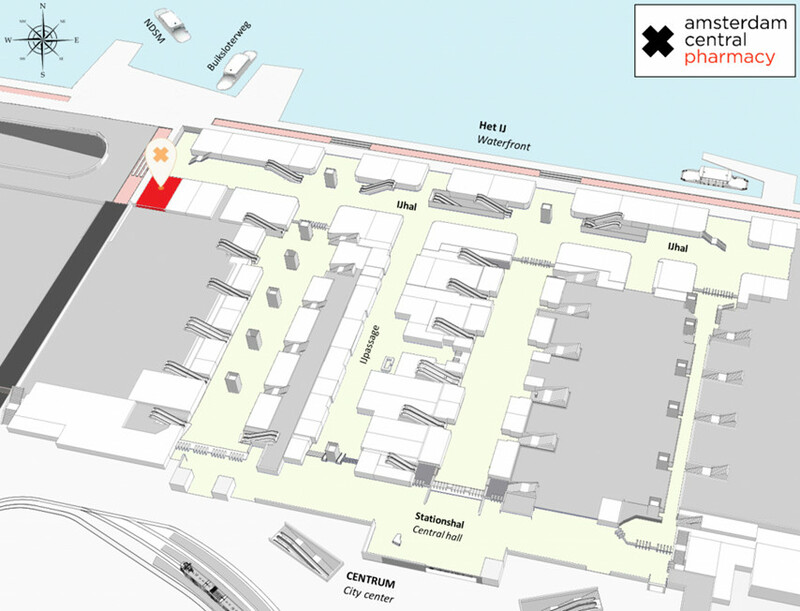 We are situated at the northwest side of Amsterdam Central Station. This central location makes our pharmacy ideal for Amsterdam residents who live in the city center. Travelers, tourists and commuters are very welcome to visit us too! You don’t have to register to make an appointment. Our pharmacy - located right next to the doctor’s practice - has a 24/7 medicine pick up thanks to Dr. Robot. This medicine machine makes it possible to pick up your medicine whenever it suits you. Feeling sick during your holidays and not able to visit to the pharmacy? We offer a delivery service too! In our drugstore you can find a wide range of luxury beauty products, such as: Vichy, La Roche Posay, Eucerin, Avene, Embryolisse and John Masters. We also offer products that support a healthy lifestyle, like chocolate from iQ Chocolate, organic tea from Jacob Hooy and Tea Tox and nutritional supplements like Solgar and Blissfuel. Expat Medical Centre Amsterdam is offering high quality medical service to Expats living in Amsterdam and Amstelveen for over 10 Years now. We are the first doctor service specialized in treating expats in the Amsterdam area. By treating thousands of expats, we developed knowledge of their special needs, and built a specialized team that is keen on addressing the special needs of expats. Our internationally orientated staff covers most languages,and our experienced General Practitioners treat most medical conditions. In case a referral to a specialist or paramedic is required, we don't waste time. Over the Years we built a network of Expat orientated medical professionals, willing to understand, support and help Expats far away from home. Our Doctors work from 2 offices in central Amsterdam, and 1 in Amstelveen.